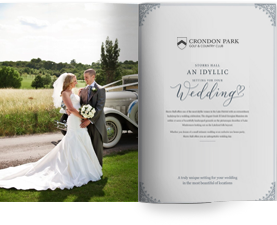 Crondon Park Wedding Barn Venue is set in the valley of Crondon, in the village of Stock. Crondon Park has recently won ‘The Best Countryside Wedding Venue’ and been highly commended for ‘The Best Barn Wedding Venue’ as voted by our couples, which is an amazing honour. We are constantly striving to be the most accomplished Wedding Venue in Essex, by offering a complete and overall experience. You will find many testimonials on our website www.crondonpark.com. We pride ourselves in offering a high standard of catering and service, that we feel is reflected in the very positive comments that are made about us. We would like to thank the couples that have taken the time to write such nice comments about us. Hitched and UKBride are two of the wedding industry’s largest promoters, they have chosen us as their number one recommended wedding venue in Essex. We currently have over 850 testimonials listed on Hitched, more than any other wedding venue in Essex, quite an achievement in such a competitive market. We love hearing comments from our guests, receiving feedback helps us to improve.